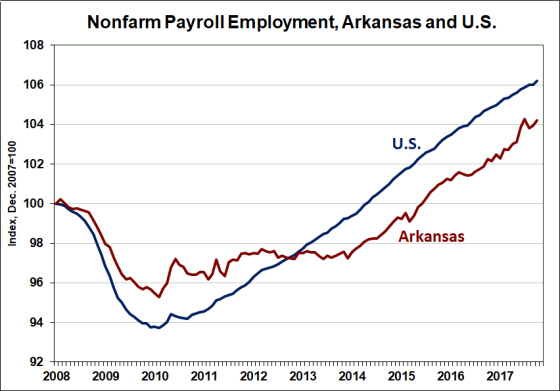 The latest report on state-level employment and unemployment contained mixed signals on the state of Arkansas labor markets. The household survey presented a relatively weak picture: For the third consecutive month, the number of unemployed Arkansans increased, causing the unemployment rate to tick up by one-tenth of a percentage point (to 3.6%). The associated household employment figures showed a decline in both the number employed (-1,870) andthe size of the labor force (-1,191). Even with the slight uptick, the unemployment rate remains exceptionally low. The national unemployment rate dropped by one-tenth of a percent in October, to 4.1%. 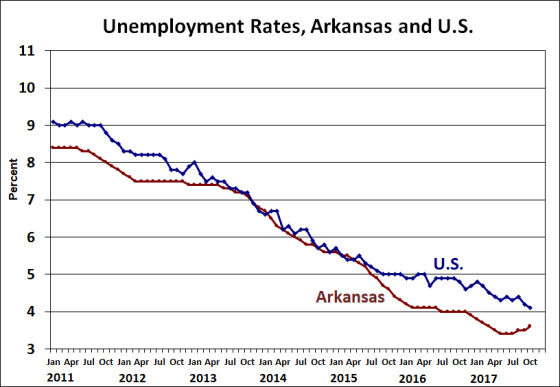 Hence, the rate in Arkansas remains one-half of a percentage point lower than the U.S. 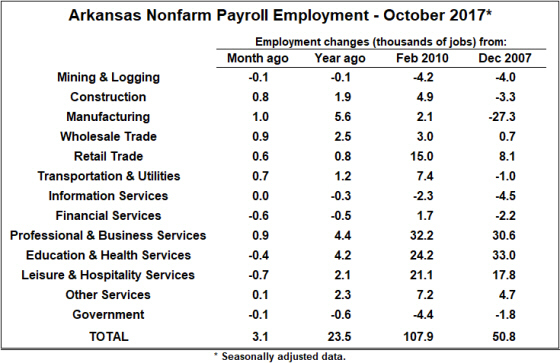 The report on payroll employment was more favorable overall, but it also contained hints of weakness for some sectors. 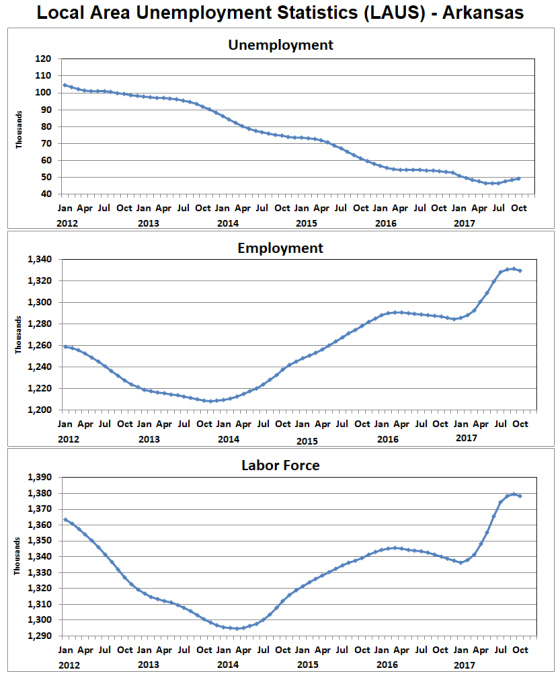 From September to October, total nonfarm payroll employment increased by 3,100. Employment growth from the previous month was also revised higher: Originally reported as +1,100 the August-September change was revised up to +1,600. Over the past 12 months, payrolls have expanded by 23,500 – an increase of 1.9%. Over the same 12-month period, nationwide payroll employment grew by 1.3%. Goods-producing sectors continued to show job gains in October: Employment in Construction rose by 800 jobs and Manufacturing was up by 1,000. For Manufacturing, October represented the fifth consecutive monthly gain. In contrast, some service-providing sectors continued to show uncharacteristic weakness. Financial Services, Education & Health Services, and Leisure and Hospitality Services all showed monthly employment declines. In the cases of both Education & Health and Leisure & Hospitality, year-over-year changes remain positive but the declines in October represent a third consecutive month of contraction. Overall, the longer term trends remain intact: Manufacturing employment remains nearly 30,000 below the level registered prior to 2008-09 recession, while most job growth has been in service-providing sectors, particularly Professional & Business Services and Education & Health Services.